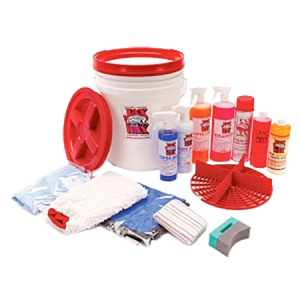 Now you can get fast, commercial-quality results by using the same products the “pros” do – and by doing it yourself!Try this Test:If you think you have a clean surface, take a piece of plastic or a baggie and place it over fingers and rub it across your finish. Even on the majority or pure “Show Cars” you will more than likely feel ”bumps” that you couldn’t otherwise with your bare fingers. All the plastic baggie did placed over your fingers was increase your sensitivity of touch. These are contaminants that are embedded in your finish. Don’t be alarmed, a lot of them are from pollutants that are present every day in the environment.Then use a Clay Bar on your finish. Try the test again and it will feel ‘Silky Smooth” and will look 100 times better. Now when you apply wax over the finish, it will look a lot more richer, vibrant and deep. 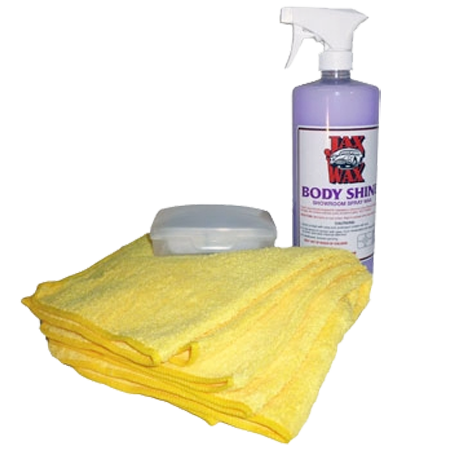 In addition, the wax will help prevent contamination from settling back in the finish. Clay will “pull” contamination from the paint without being as aggressive as using a buffer with polish or compounds. It is so simple to do a 5 Year Old can do it!There are different grades and quality of Clay, just like anything else. On the retail shelves you will see many colors and slick packaging of Clay Bars all with varying quality and effectiveness. For “commercial quality” clay there are primarily 2 colors, Gray and Purple.The Gray Clay Bar is called a “Light Cut” and the Purple Clay Bar is called a “Heavy Cut”. For normal “claying” a Gray Clay Bar is all you need.These Clay Bars are the same ones that we sell to our commercial customers consisting of hundreds of car dealers, professional detailers, auto body shops and classic car owners every day. Jax Wax Clay Bars are commercial products that are of higher quality than than most “retail” Clay Bars sit on the “wax wall” vying for your hard earned dollars with slick labels and packaging. Don't be concerned making a mess – it will wipe up just fine! 2. Tear off a small piece of the clay bar. The reason that you want to use just a piece of it is because if it hits the ground it will pick up contaminants such as dirt that could scratch your finish. This way you don't waste your whole clay bar if that happens by accident. Let the clay do the work. You will feel the contaminants being picked up through your fingers. You will tell by feel and sight when the surface is clean. Keep turning over the piece of clay, continuing to fold the clay into itself to get to a fresh piece. Once the piece of clay becomes dirty after folding, throw it away and grab another chunk. Be patient, especially with over spray – the clay will pull it off the finish – take your time. Don't treat it like you would sandpaper – it is our natural tendency to use clay with pressure – don't do it – let the clay lift the contaminants from the surface – don't apply pressure. Do a little section at at time. Don't make it a "project". Break it down into small sections, keeping it fun! For example, do the hood one day, front fenders the next, etc. Do it when you feel like spending some time working with your car – it doesn't need to be done all at once! Be the first to review “Jax Wax Professional Grade Clay Bar Kit” Click here to cancel reply.